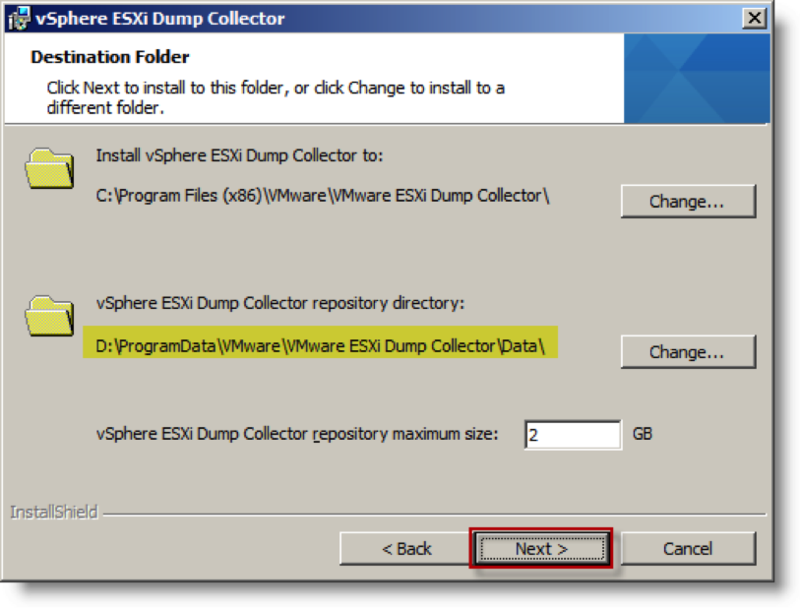 This post is a walk through of installing and configuring the ESXi Dump Collector service on vCenter and configuring an ESXi host to use it. The Windows Server 2008 R2 VMs I use for vCenter are configured with additional drives for installing applications and storing data. In this example from my virtual lab, I have a “d:\” drive for applications and data. 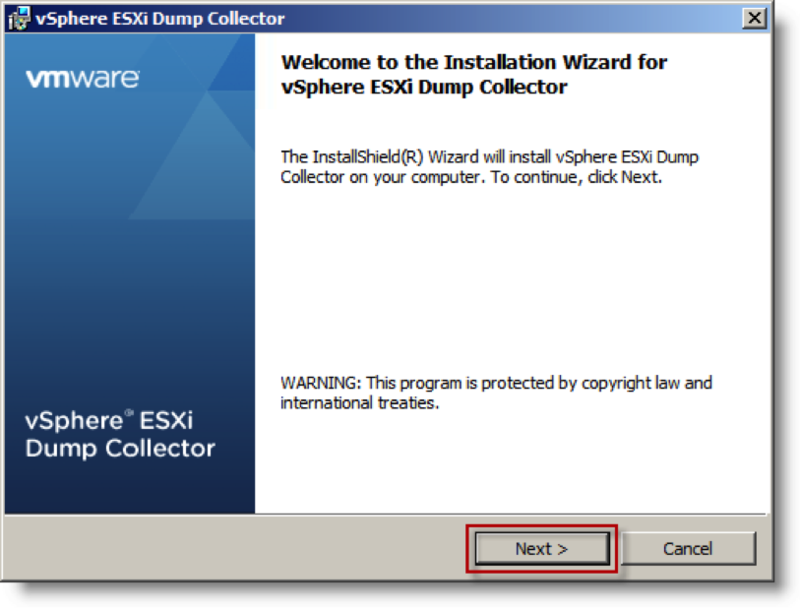 The installer for the dump collector in included on the vCenter installer ISO image. I mount the ISO image to the Windows 2008 R2 VM where I have installed vCenter server. Launch “autorun.exe” as an administrator. From the VMware vCenter Installer, select “VMware vSphere ESXi Dump Collector”. Then click “Install” to begin the installation. After the installer starts, select “English” as the language. On the VMware vCenter Server Information page, enter the appropriate information for connecting to vCenter. Click “Next >” to continue. If you are using the default self-signed SSL certificate for vCenter, you will receive a message with the SHA1 thumbprint value for the vCenter server’s certificate. 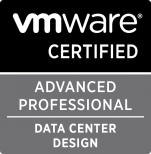 Click “Yes” to trust that the certificate for connecting to the vCenter server. 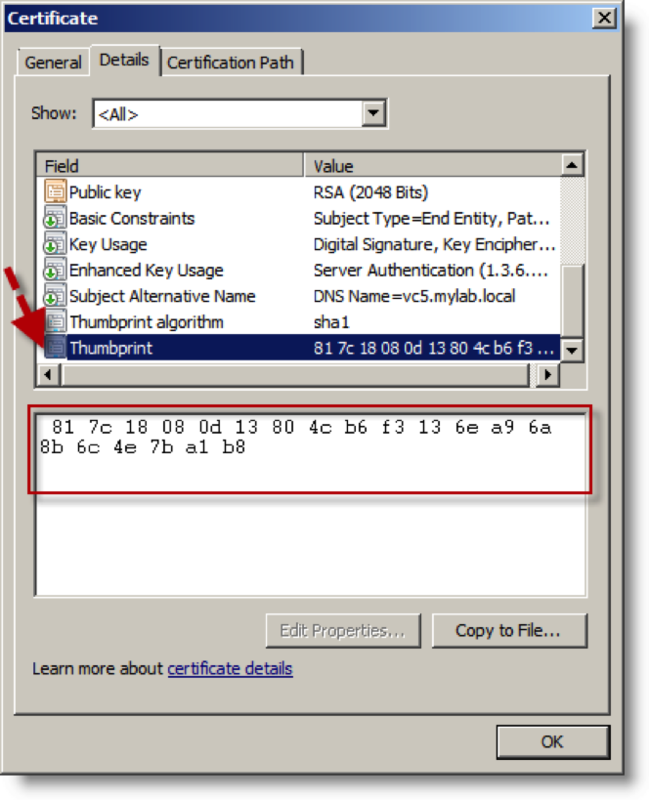 You can verify the thumbprint by looking at the certificate properties on your vCenter server. 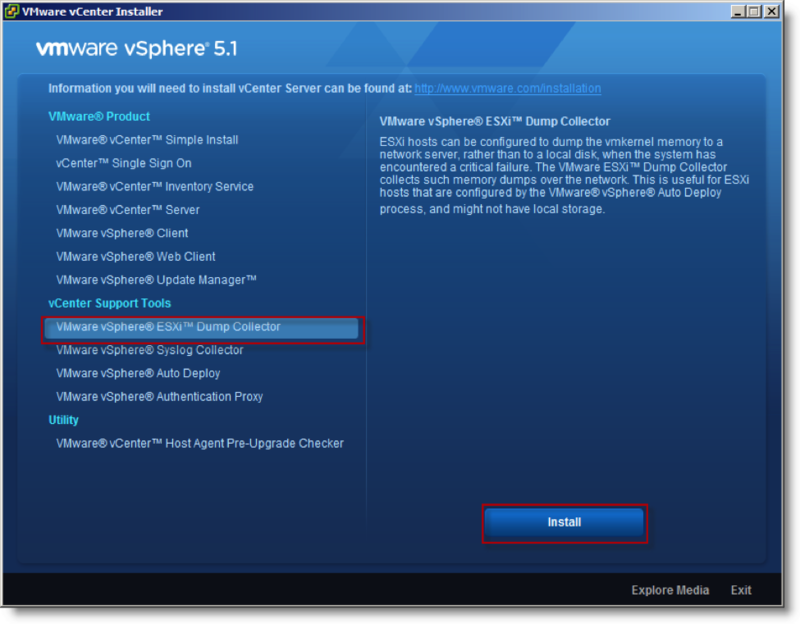 Notice that the thumbprint from the installer matches the thumbprint on the vCenter server’s certificate. On the vSphere ESXi Dump Collector Port Settings page, click “Next >” to accept the default value of UDP port 6500. After the installer has completed, click “Finish” on the Installer Completed page. 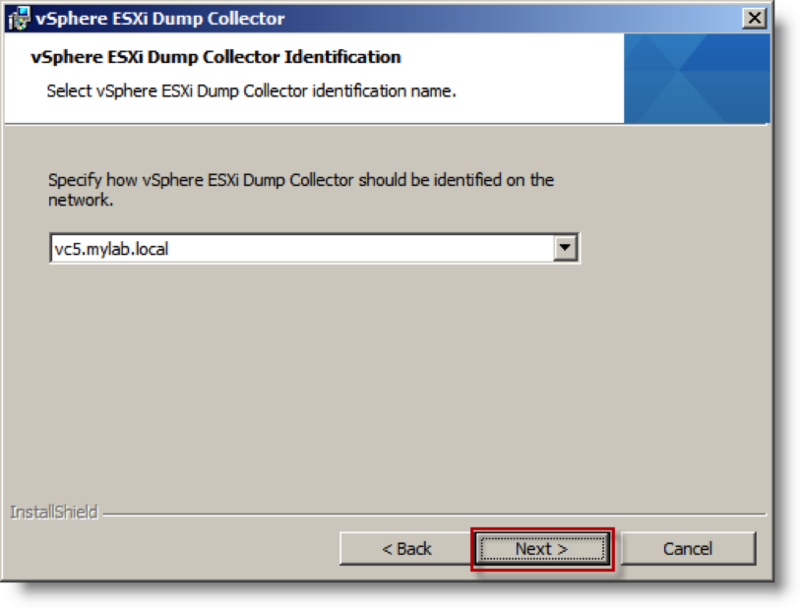 You can view the configured settings with the vSphere Client by selecting VMware ESXi Dump Collector from the Administration page. 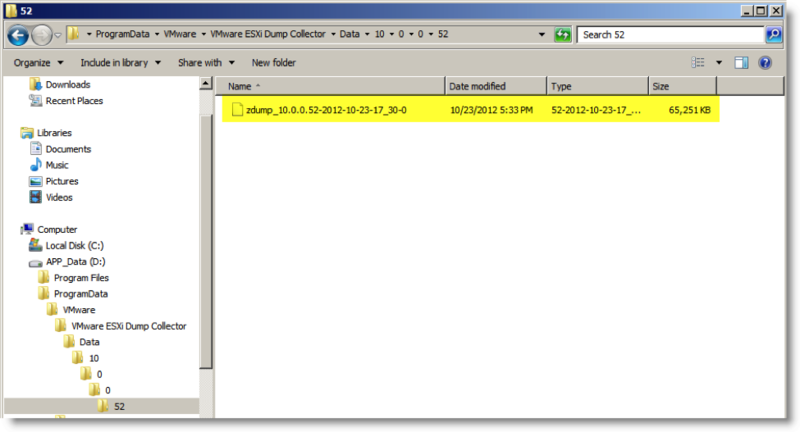 Configuring an ESXi host to transmit the core dump over the network to the dump collector service. 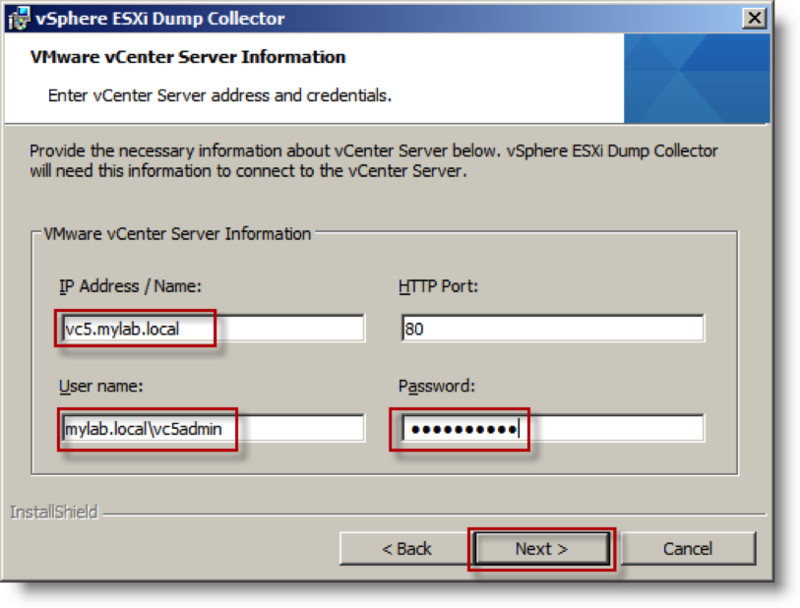 Now that we have installed the dump collector service, we need to configure the ESXi hosts to send their diagnostic dump files to the vCenter server. I set this up through the ESXi console. You will notice that I am logged in a “root” as I had not configured the ESXi host to use Active Directory authentication yet. Any user account that has the “administrator” role on the ESXi host can configure these settings. 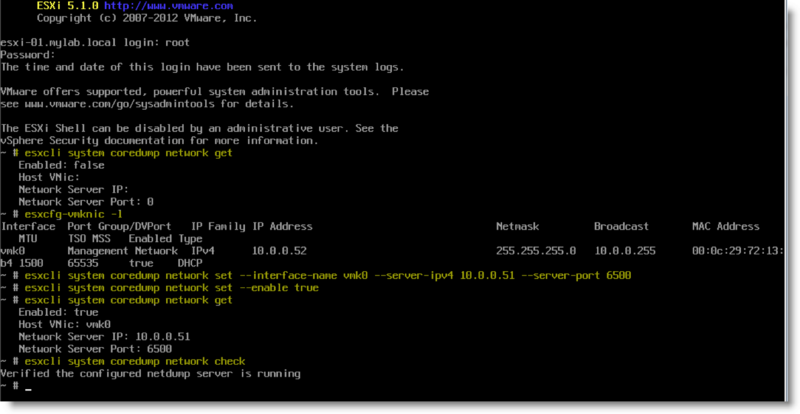 You have to enter the interface name and server IPv4 address. The port is optional if you are using the default of 6500. More information about managing the ESXi core dump disk partition is in the online documentation here. Now that the vCenter server has the dump collector service installed and the ESXi host is configured to use it, I had to try it out! Using the vsish tool and specific setting that Eric Sloof or NTPRO.NL described in his post “Lets create some Kernel Panic using vsish“, I crashed the ESXi host. 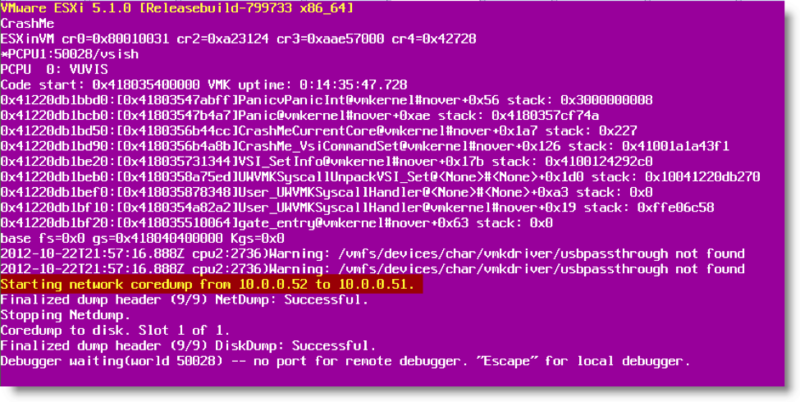 As you can see in the screenshots, I was rewarded with a purple screen and success with transmitting the dump over the network to my vCenter server! Here is the coredump file that was transmitted. Success!